Largehearted Boy: Book Notes - Michael Ruhlman "In Short Measures"
Book Notes - Michael Ruhlman "In Short Measures"
Michael Ruhlman is one of my favorite cookbook writers. In Short Measures: Three Novellas proves him a talented fiction writer as well. 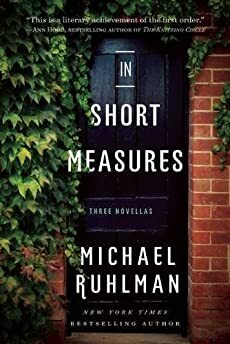 "In Short Measures is a propulsively well-written trio of novellas linked by a sense of loss and an inquiry into the impossible past. Ruhlman's voice is poetic and visceral, and his characters feel both familiar and strange in the way of the best fiction. This is a richly layered book, full of surprises and pleasures." After my mentor Reynolds Price died, I began to write an essay in an attempt to understand my profound grief following his memorial. As I did so, a female voice pressed in on my thoughts and I began to write a fictional story about the event. Because I work on multiple projects, I use music to return my thoughts to a specific project. Each morning when I turned my mind to this story, the first fiction I would finish in 20 years and the first I would publish, I listened to this rondo three times successively as I made my way into the story and the voice. It is a melancholy piece that suggests reflection on one's past, a journey my heroine was about to take as she re-connected, after 20 years with only man she'd ever loved. Mozart wrote this when his public performances were in decline and, according to one critic, "signifies his turning away from the stage; it is an intimate piece of chamber music for solo piano, full of melancholy, poetry and confession." As I turned away from food writing to write a fictional love story, this music fit the mood I sought to convey. My novella jumps to Los Angeles midway through with a considerable plot twist. I also happened to be in Los Angeles at the time I was writing it, staying at the very funky Standard Hotel on Sunset (bean bag chairs in the rooms, a woman in a fish tank behind the check-in desk). I'd found this song and three others by Adele on my daughter's playlists and took them, listening to them obsessively (after the rondo) as I moved into the new section, in which the heroine also stays at the Standard. This was long before Adele was overplayed. And even so she has an extraordinary voice. I hadn't thought much about the lyrics until my son, age thirteen at the time asked me, "How do set fire to rain? I don't understand." I didn't know what to say. This too from my daughter's playlist, without which I would be hopelessly mired in the 1970s (not a bad decade to be mired in, music-wise, but limiting nonetheless. It also gave me a different kind of energy to write to. She was a powerhouse voice. She died the summer I began writing the first novella. I listened to this song throughout my 1970s youth, along with just about every Neil Young album available to me. It would have been what the main character listened to on his drunken nocturnal cruises along Mulholland Drive, all too aware of time's passing and the inability to return to a more promising self. Another song my doppleganger would have been listening to, although with considerably less hope than the song describes. I was a devoted Deadhead throughout college and even today, myself graying, long for the freedom and abandon of that kind of vagabond life. As noted above, I use music to move my thoughts away from, say, describing how to cure a ham in a hog bladder into a fictional narrative. The second novella begins on the night of a blizzard after my heroine commits a felony in order to save her husband, a move that throws this staid couple in old suburbia into a turmoil they could never have imagined. Again, it's a moody, melancholic piece that guided the prose. I would listen to it thrice consecutively before moving on to the following. Here the melodramatic mood continues as the married couple in "Strong Conspirators" find themselves deep into their avoiding being caught in what has become a double felony. The husband has killed a pedestrian while driving and the wife has lied to the police by saying she was at the wheel. The requiem held the spirit of death in the air as there is not only a literal death but also the death of the safe placid life they'd once enjoyed, and the death of their youth, which the felony now cuts off all connections to. I first heard Dave Matthews Band, this song in particular, while driving through snowy roads on Martha's Vineyard to begin work on a book about wooden boats and the people who build them. So entranced by the vocal rubberbandishness of Mr. Matthews, I bought the CD (winter, 1999), and listened to it throughout our time on that beautiful island. So when I moved the scene from suburban Cleveland to Martha's Vineyard, I used this song and the album "Before These Crowded Streets," to return my psyche to that uncommon place. The third novella describes a middle aged writer who looks back on a long ago love after reconnecting with her by coincidence, and this song reminded me of the girl who inspired it. It's repeated on the playlist I made for writing this story three times and brought me back to the time I was writing about, and brought my thoughts back to the story, with its subject, leaving the one you care about, or their leaving you. "I wish there were something you could do or say, to make me change my mind and say." But they leave each other, and lose each other. Again, a return in my mind to the 1980s and the girlfriend who was the trigger for the story (though I should say that it is not her story or ours but is more a profile of this writer in middle age). Also it's such a happy song, a good reflection of those days when one has so little responsibility, when we, those lucky ones, can do more or less as we please. I would put on "head phones" and hit play on my "Walkman" to listen to this song. My friend and I would sit between the cars of the train as we zipped though the English countryside during our junior year abroad. If we'd thought ahead, we'd sip whiskey from a flask and smoke cigarettes and be wistful travelers without a home and happy to be so. I came to this song late in life, last fall actually when the final novella was composed, and it so summed up my character's disconnection from his lost love, his inability to connect with his current life, his general sense of having failed to take advantage of the most promising moments of his life, of having squandered his greatest opportunity, that I actually paid cash to quote the song in the book. It's a melancholy tune about missed connections, the concluding notes of the final novella.